The Recipe: In 2013, Midsummer falls on June 21, a Friday, perfect for a Scandinavian feast and staying up late to revel in the longest day of the year. But Simple Grilled Salmon makes for a feast any night of the year. You won't believe just how simple this is, worth the splurge! We've been enjoying the leftover salmon cold (yes, it's amazing cold) for a couple of days now and last night decided, "We really must grill salmon more often. How about Friday?" The Conversation: How to celebrate Midsummer, Finnish-style. Imagine, if you will, the summer solstice in the Land of the Midnight Sun. In the north of Finland in Lapland, the sun never sets on the longest day of the year. In the south, in the capitol city of Helsinki, the same latitude as Anchorage, the sun does go down but at midnight, you can still read through the open window of a “mokki” (cottage) on the Finnish archipelago. Summers pass quickly in the North, it’s no wonder that Finns beg, borrow and steal all the sun while they can. The year I lived in Finland, my Finnish sister Ritva and I celebrated “Juhannuspaiva” (Midsummer) late at night by eating “makkara” (sausages) we cooked on sticks over an open fire and smeared with creamy-hot “sinappi” (that's mustard, this is my Homemade Finnish Mustard). Lakeside, a huge “kokko” (midsummer fire) burned, reflections of other fires danced across the icy forest-rimmed water. I’ve yet to give the Midsummer party imagined in my head but last year, we sat with dear friends around a small fire in the country until after midnight, watching the flames crackle, listening to bullfrogs and coyotes in the distance, telling stories and laughing late. It’s worth marking, the summer solstice, lest we forget that too soon, the darkness will descend again. ALANNA’s TIPS You’ll want to buy extra salmon to plan for leftovers, this makes wonderful sandwiches and salads and dips and omelets and and and ... ... ... Some times the fish can stick to the foil, that’s part of the reason for the herbs, lemons and onions. I have good luck with the new non-stick foil from Reynolds. Foil really saves the day here, otherwise the fish sticks to the grill rack. Kitchen Parade is written by second-generation food columnist Alanna Kellogg and features fresh, seasonal dishes for every-day healthful eating and occasional indulgences. Do you have a favorite Midsummer recipe that other Kitchen Parade readers might like? Just send me a quick e-mail via recipes@kitchen-parade.com. How to print a Kitchen Parade recipe. Never miss a recipe! If you like this recipe, sign up for a free e-mail subscription. If you like Kitchen Parade, you're sure to like my food blog about vegetable recipes, too, A Veggie Venture. Follow Kitchen Parade on Facebook! Prepare the grill, letting the coals or wood burn down to medium-hot embers. For a gas grill, heat on high for 15 minutes, then reduce heat to medium. Cover a piece of heavy foil with herbs and lemon or onion slices. Arrange the salmon filet on top, skin-side down. Sprinkle lightly with salt and pepper. Top with fresh dill. 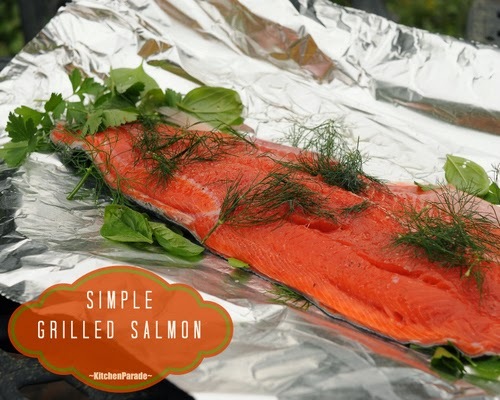 Move the foil onto the grill, let salmon gently cook until cooked through, timing will depend on the grill’s heat. To know when the salmon is cooked, watch the color and texture. As it cooks, the salmon will lighten in color; white areas will appear on the sides; the appearance will be less wet and “squishy”. Cut into the thickest part, the flesh should easily separate and the interior flesh should be translucent (rare) to light opaque pink (medium). If you’d like to use a thermometer, cook to 125F – 130F. Cut cross-wise into individual servings. For real Scandinavian flavor, serve with boiled red new potatoes tossed with butter and fresh dill (or Finnish Summer Potato Salad) with sour cream on the side and beer or vodka to drink. Watch for bones! LEFTOVERS Keeps for a day or two, especially good cold. NUTRITION ESTIMATE Per 1/4 pound: 173 Calories; 5g Tot Fat; 1g Sat Fat; 72mg Cholesterol; 68mg Sodium; 0g Carb; 0g Fiber; 0g Sugar; 25g Protein. WEIGHT WATCHERS POINTS WW Old Points 4, WW PointsPlus 4 CALORIE COUNTERS 100-calorie serving, 2-1/3 ounces (66g); 50-calorie serving, 1-1/6 ounces (33g). Inspired by my long-time friends Lisa and Gary, from Lisa’s food blog, My Own Sweet Thyme. She posted her recipe on Thursday, Saturday I was buying salmon! Lisa’s recipe for Simple Salmon includes oven instructions and lots of tips. You need to add in a sauna to this description! What a fabulous piece of salmon you have here--I've got the herbs (ok, my dill is still being babied after the varmint attacks, but I've got fennel going strong) and the grill (we're starting off the summer of grilling tonight with shrimp), I just need the salmon to try it out.